Why did the hippie movement get started? How will your generation be defined? Today’s Wonder of the Day was inspired by Mrs. Zachman's Class from Woodbury, MN. Mrs. Zachman's Class Wonders, “Who are hippies?” Thanks for WONDERing with us, Mrs. Zachman's Class! Do you ever question decisions made by your government leaders? Or wish the world could be more peaceful and loving? These are a few of the hopes of those who joined the “hippie" movement in the 1960s. The hippies took a stand against conformity. Conformity means going along with or following decisions that are generally accepted by others. Hippies got their name because they were “hip" or aware of what was going on in the world around them. The hippie movement grew out of the earlier beatnik movement, which was a group of nonconformists living in the Haight-Ashbury district of San Francisco. One way hippies showed their dissatisfaction with society was by their appearance. This was a visible way to represent their beliefs. Many went barefoot, wore bell-bottomed blue jeans, and sported tie-dyed t-shirts. Both men and women had long hair. However, the hippie movement was about far more than looking and acting different from the general public. Hippies protested against the Vietnam War, which they felt was unjust. And they supported a return to a more peaceful and natural lifestyle. They displayed the peace symbol on many things to show they opposed the war and supported world peace. And hippies began giving the peace sign, one way still used today to indicate a desire for peace. Some of the concerns we have today about taking care of our environment began with the hippies. Many hippies wore flowers in their hair to emphasize their love of nature, described in a popular song of the time. This led to the popular phrase “flower power." The hippies also expressed themselves through new kinds of music. They listened to psychedelic rock 'n' roll and folk music that protested the war and encouraged freedom from conformity. They held music festivals and large gatherings where they protested the war. At the time, these protests were often called “sit-ins." People sat down and refused to leave public places as a way to draw attention to their cause and for their beliefs to be heard. Other practices attached to hippies, however, were far more extreme. Some hippies “dropped out" or abandoned an accepted lifestyle as a way to reject mainstream society. The hippie movement was not just limited to the United States. It occurred in many other countries, including Mexico, Great Britain, Australia, New Zealand, and Chile. In addition to the influence the hippie movement had on fashion, popular music, television, film, literature, and the arts, we can trace some of our currently accepted practices back to hippies. These include a growing interest in health foods and saving the planet. The hippie movement also impacted our broader acceptance of other people — an important factor in today's more global society. If you enjoy sitting in the corner, you might have a problem with tomorrow’s Wonder of the Day! Are you a hippie? Probably not! The hippie movement was a long time ago. However, some people still try to live by the ideals of that time. If you're not a hippie, then what are you? Fifty years from now, what will historians say about you and your generation when they look back in time? What beliefs, music, fashion and events will define your generation? Take time today to think about yourself, your friends and your life. Talk with older adults or people who have a different perspective. How do they view your generation? How are things different today from when they were your age? What words would they use to define your generation? 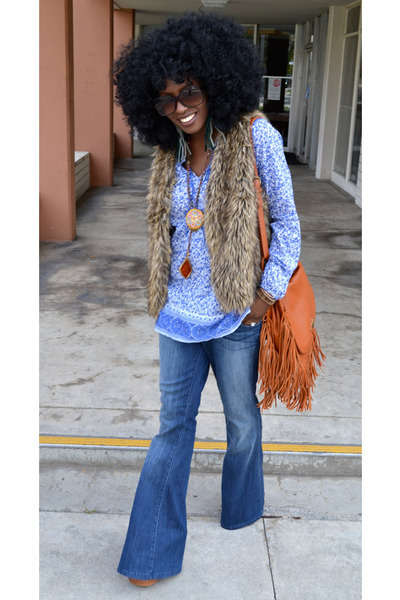 Even if you're not a hippie, you can still dress like one! Do your parents have any old bell-bottom jeans? If not, no worries! 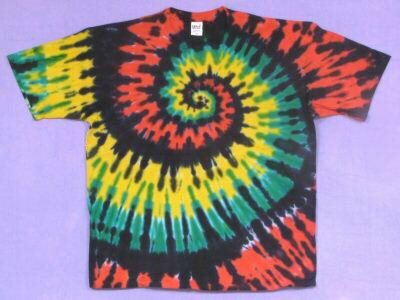 Tie dye t-shirts are still fashionable today, too. You might already have one! If not, click here to find out how to make your own tie-dye t-shirts! what are hippies can you comment wonder pls . Hi, ella! That is a great question to think and WONDER about! What are some of the ways you think your generation will be defined? HOw will our generation be defined? "Fifty years from now, what will historians say about you and your generation when they look back in time? What beliefs, music, fashion and events will define your generation? Take time today to think about yourself, your friends and your life. Talk with older adults or people who have a different perspective. How do they view your generation? How are things different today from when they were your age? What words would they use to define your generation?" Hi, kayla! Did you add questions to the Wonder Bank? Before I read this I love wonderopolis so much BYE! 😊Thanks, Jaylin!! We love having you as a Wonder Friend! Let us know what you think of this Wonder after you read it! Thanks for sharing, v! Are grapes your favorite fruit? What do you think the most popular fruit is? Wonder 2097: What Is the World's Most Popular Fruit? will help you find out! I like turtles turtles are coooool beans. That's WONDERful!! Have you checked out our Wonders about turtles? We're glad you enjoyed this Wonder!! Thanks for being our Wonder Friend! We are a website obsessed with WONDERing! And you're already here! Thanks, Wonder Boy! Thanks for the article! This helps me understand more about a Hippie. I recently read a book called Wednesday Wars and I was interested in learning MORE about a Hippie than anything. Thanks again Wonderopolis! Clear Sky is the name of a character in a book. YES THE WARRIORS SERIES IS AWESOME!!! Awesome! So glad you learned something new, especially about such a unique topic. Glad you are WONDERing with us! Hi qwqwqw! We're glad you are WONDERing with us! That's SUPER news, Kathrine! We hope you'll visit Wonderopolis again soon! You rock Wonderopolis. I've been trying to improve my pop culture knowledge for some pub quizzes and this was exactly what I was looking for. I've been curious about hippies every since I used this quiz app and found out about the term "boheimian". I was (am) a 'hippy'. I put a suit on, and now I work for change from within what we called 'the establishment'. It wasn't so long ago for many of us. And it was/is so very much more than long hair and tie-dyed clothing. It wasn't style. It was belief in personal freedom, choice, love and kindness triumphing over evil, care for our mother earth, allowing each human being to 'do their thing', co-existing in peace, belief in the power of the 'one' and the individual to affect positive change, belief that one must take responsibility for ones actions; belief that we are all on this journey called life together. "Feed each other" was a cry at Woodstock. Please do my generation justice. We dared to be different. We broke the molds that restricted people and allowed people to grow in beautiful and sometimes painful but needed ways. This is our legacy. This is what it meant (and means) to be a 'hippy'. Namaste, folks. Peace, love, and shining thoughts. I loved this Wonder! Thank you Wonderopilis! Does anyone know how the hippie movement came to New Zealand? We think that would be a great WONDER for you to explore, Wonder Friend Mikie! How could you find out the answer to your question? Happy WONDERing! Hi I think that all hippies should eat pie. Your piece on hippies was amazing. This story is cool I like it. Who doesn't like music? Do you think if I try hard enough, I could be a hippie? He, he. I love saying that word! :) hippie hippie hippie!!!! Hello Wonderopolis! It's nice to see you again! Two new words I learned from this selection were folk and psychedelic. Hippies wanted a change. They liked to listen to folk music and psychedelic music. I also have a question. Why did Hippies where bell-bottoms and tie-dyed shirts? Well thank you Wonderopolis for making me wonder!!!! Hey, I love fashion! So I go through different phases like Scene, Girly, A Tomboy, and one day I decided hey! Lets be a hippie, so I grabbed out my headband, put it on my forehead, and found a vest and some bell bottoms in my mom's old chest. I wore some peace signs. Pretty funny stuff! Hey, do you guys think that hippies are always colorful, or could they be just one color? Oh, and maybe your next wonder should be were do puppies come from. I love this wonder. Me and my friends LOVE to dress up like hippies (tie-dye and peace signs are my TOTAL style, jk)! I love this wonder. Where do you come up with them all??? I'm not a fan of hippies, one lives outside my house. He annoys me. Anywho, great wonder! Awesome wonder today! I loved learning about the hippie movement! Very interesting! Keep going and stay alive, Wonderopolis!!!!! Hello, Nick! Thanks for telling us how much you liked this Wonder about hippies! We hope you'll keep visiting Wonderopolis! WOW! It seems like hippies are their own peaceful religion. I thought that the peace symbol van was AWESOME because... it looks soooo cool! I would love one of those when I get older. When ever I hear the word hippie, I think about my uncle because he has long hair, but no one else in my family has long hair, only the girls in my family! Ha, we have really long hair these days! Well, my dad once had long hair but he was 16 when that happened! Bye, I LOVE reading your stories! Nice job, Wonderopolis! When I looked at this title, it made me think of a Scooby Doo movie. One of the parts is when Shaggy and Scooby are in a hippie van. I think that it is really cool how the hippies made a stand. If you think about it, hippies were not that different than regular people. Hippies needed money, shelter, food and water just like us. I think that this was a very interesting wonder of the day. Cool. My sister has always LOVED hippies. I think I want to be a hippie for Halloween, now. I will tell you if I am! THANKS!!!!!!!!!!!!! "All you need is love" is a great song that talks about why many hippies wanted peace and did not want war. I like doing the peace sign. I never realized that the hippie movement was in other countries, too. I like learning about cool things like this on Wonderopolis. Thank you! I love the video. My friend does tie-dye shirts. How you speak Spanish? That was a great wonder! WOW. I was not ready for that to hit me. I do not like the Beatles. My dad loves the Beatles. He just told me that hippies love to listen to the Beatles. I am not a big fan of hippies, they're just not my style. I had my dad watch and listen to the video. He loved it very much. I am off to listen to my music now. I learned a lot from this wonder today! I never knew that hippies get their names because they are "hip". One year for Halloween, I was a hippie. I wore a tie-dye shirt, blue jeans, and a peace necklace and earrings. I think the wonder today was VERY cool! I use to think a hippie was someone with long hair, because my Dad would always say, "Get a haircut, you hippie." Now, I see it in a whole new perspective. Sometimes I agree with the hippie movement. I think it is important to believe in what you want to believe in, and not get left out for your beliefs. My generation is very accepting of others. We are bold, strong, and not afraid to hold on to what we believe in. Hi, Wonderopolis! I don't like hippies, they live in vans and they're so peaceful. I don't get them! But, I'm not trying to be mean. A hippie, I think, is a person trying to bring back the 70s. Wow, Wonderopolis! This is awesome! I thought it was really neat to learn all about the hippie movement! I have always wondered how the hippie movement started, and this wonder made me laugh and answered all my questions! Last year for Halloween, I dressed up as a hippie. I also enjoyed your selection of music in the video! The Beatles were a huge part of the hippie movement, and I enjoyed watching the video! Good job on this one, Wonderopolis! Hippies took a stand against what? Hippies were known for protesting against which war? cWorld War I Not Quite! Protests in which people sat down and refused to leave public places as a way to draw attention to their cause were known as what?